Did you use Seagrass limestone in addition to your soapstone? If so, can you please comment on how practical it has been to live with in a working/real kitchen in terms of staining and marking? 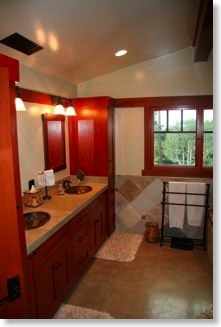 I actually used it in my master bathroom (floor, countertop, shower bench) and laundry room (floor). Take a look at those pictures to see it. I haven't noticed any problems with staining but then again it's only getting water and soap on it. I would think that as long as you keep it sealed it should be fine. Even granite stains when it's not sealed but is probably more widely used than anything else. If you have seen my kitchen pictures then you will notice I used soapstone. One of the main reasons is that you don't need to seal it because it is non-porous.